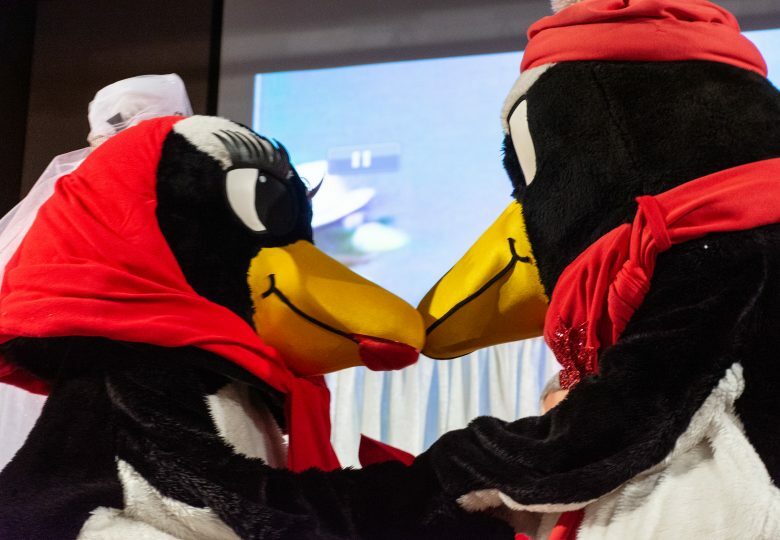 A red and white vow renewal ceremony for Pete and Penny, Youngstown State University’s beloved penguin mascots, brought students, faculty and the Youngstown community to the Chestnut Room in Kilcawley Center on Nov. 20. 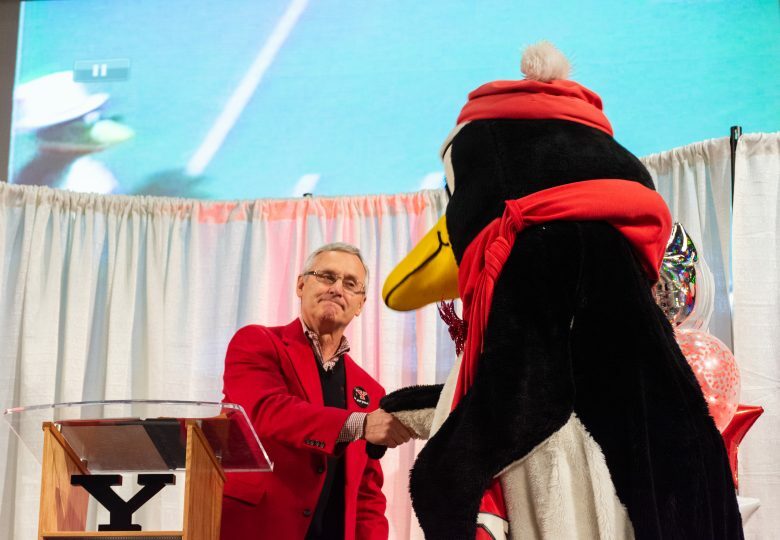 The ceremony, officiated by YSU President Jim Tressel, was organized by YSU’s Spirit and Tradition Committee with the goal of making Penny’s presence more prominent in campus life. 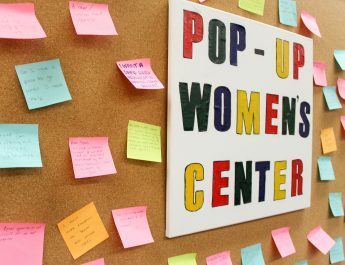 Tyler Carver, a senior social work major and STC member, said when he first found out about the opportunity to help organize the event, he stepped in immediately. “Penny has been missing for a long time, and [the STC] felt the ceremony was a very public and empowering way to bring her back,” he said. 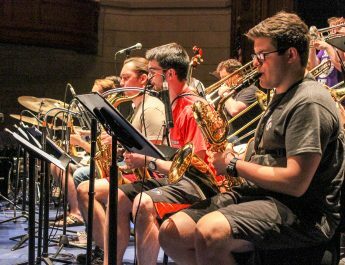 The STC was formed to educate students, faculty and the community on the history and accomplishments of YSU and promote events on campus that cultivate spirit and tradition. 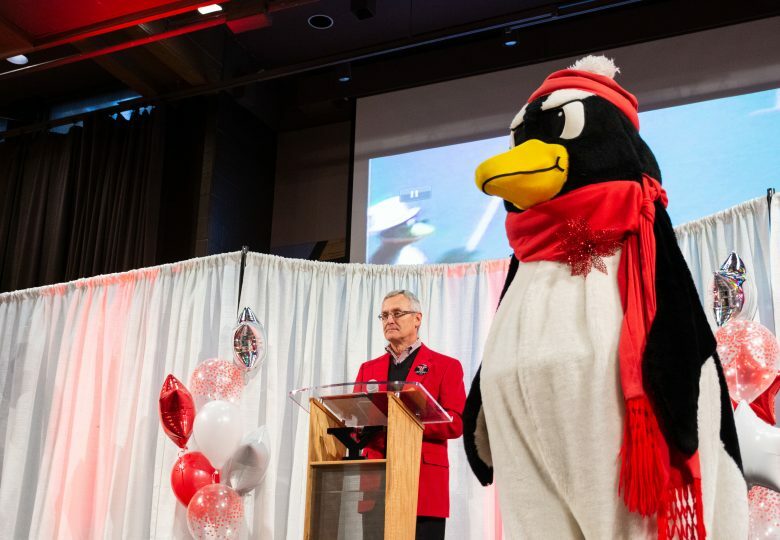 “The STC is still deciding on future plans to continue incorporating Penny more into YSU, but the ceremony is the perfect transition to set these plans up,” Carver said. Michele Ristich Gatts and Carol Bender, who were Pete and Penny in the original wedding ceremony Nov. 21, 1986, came back to serve as witnesses in the ceremony. Gatts said she and Bender planned the entire 1986 ceremony that took place during halftime at the YSU vs. University of Akron football game. 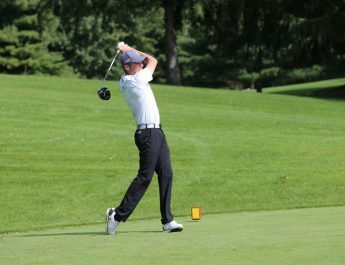 According to Gatts, the wedding also took place during President Tressel’s first year as coach of the football team. A local weather forecaster officiated the original ceremony and Zippy, University of Akron’s kangaroo mascot, was the best man. Footage of Pete and Penny’s original wedding was played on a projector after Tuesday’s ceremony for guests while they enjoyed cake, cookies and photo opportunities with the mascots. Jenn Martin, a YSU graduate who was Penny from 2002 to 2006, said she is happy to see Pete and Penny together again. Martin said her favorite part about being a mascot was attending all of the football and basketball games.